Sea Life Centre with the Octonauts! I'm guessing by now most of you know that I love Blackpool! 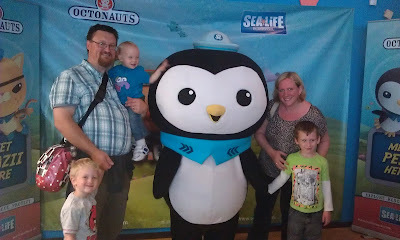 Everywhere we've been this summer, like supermarkets, play areas, etc they have been giving away "kids go free" tickets for the Sea Life Centre, and once we saw that the Octonauts were going to be there too the kids were begging to go! It would have been heartless to refuse them! Georgie is getting to the stage now where he does not want to be in his push chair any more. So we thought we'd risk letting him roam free this time! Last time we went (last summer) Georgie was only a few weeks old and in no position to get involved. This time he wanted to be part of EVERYTHING! 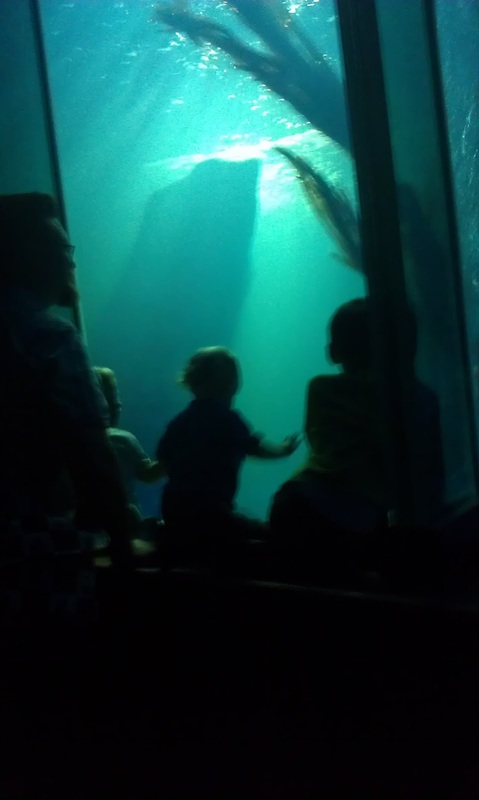 He was clambering up the sides of the tanks and displays trying to get a closer look at the fish and marine animals, and laughing like mad every time anything moved! Pretending to be at the bottom of the sea! Jack was loving the quiz challenge going round the Centre. He was gutted when mummy got a question wrong (baaaaad mummy not knowing which oil spills are largest) and he lost a mark, but was very thrilled with himself for getting the rest right. I think the best part for him was walking through the shark tunnel and "tickling" the tummy of a shark that was laid across the roof of the tunnel! Tom's not as into animals as his brothers, he's not into feeding animals much, or touching them (he's a little nervous of them, it's taken over a year to pluck up the courage to feed lambs and calves at the petting zoos), but he DOES like fish in tanks. His favourite bit is - as it always has been - the clown fish. "NEEEEMOOO FIIIIIISH!" I think he would have stood staring at them all day if we'd let him! It's a fab day out for the kids. My lot love going and it is becoming an annual tradition. We highly recommend it! If you want to know prices you can follow this link and keep an eye out for "Kids Go Free" vouchers. They are EVERYWHERE!